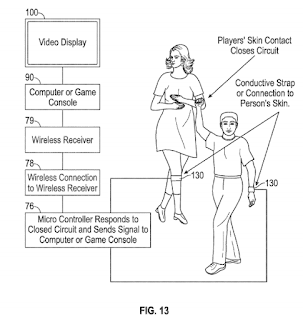 The ‘707 patent is a hardware patent, which covers a game controller that can be used by two or more players cooperatively. The controller senses real world movement and converts these signals into information that can control game play. The controller relies on conductive materials to sense how many players are using the controller and in which ways. 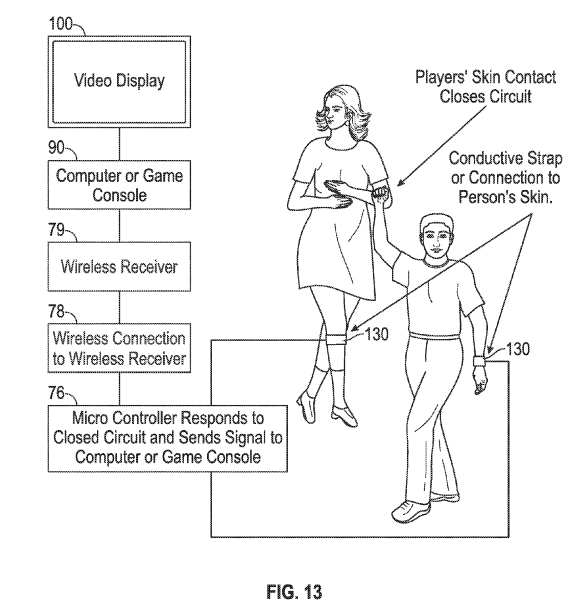 The present invention provides a video game controller and apparatus that may be used by two or more players. The users physically manipulate the control device cooperatively to the kinesthetic feedback of the other player(s) to control the events of the video game. By working together through orientation of the controller, the players can jointly move the video game object on the screen and/or govern the play of the game. whereby skin of the first player touching skin of the second player closes a circuit between the first and the second conductive materials and the microcontroller, said circuit closing causing the microcontroller to send a signal to the CPU or the game console thereby causing said CPU or gameconsole to display a video game having at least one game object that responds in accordance with the signal.